Americans throw away $640 in food a year, and are way more concerned about what it costs them than the planet. Americans trash $640 worth of food a year, and they don't even care about the effects on the planet. That's from a new study by the American Chemistry Council, which found that just 15% of respondents were concerned about the environmental impacts of throwing away so much food. What upset people most about the waste was cost, with 79% saying lost money was the biggest concern. About half of the 1,000 surveyed said they felt bad about tossing food in light of worldwide hunger. Yet food waste is a major pollution problem. It's the single biggest item in U.S. landfills, where it rots and releases methane -- a powerful greenhouse gas. Several cities around the U.S. have instituted composting programs to divert some of this waste. The biggest reason why food spoils is because people either buy too many perishables to begin with or fail to eat leftovers. 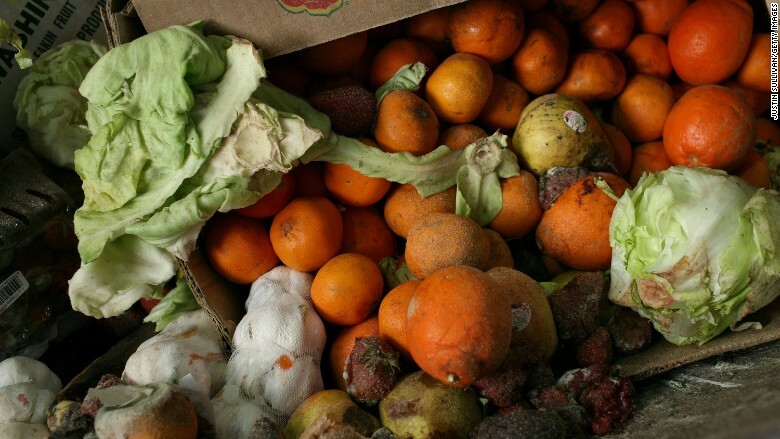 Three-quarters of respondents said they threw away food once a month. Half said they did it once a week. The results were self reported, and actual food waste may be even higher. The Chemistry Council noted that the U.S. government puts food waste at over $900 a year per household. The Chemistry Council -- which represents makers of plastic bags and containers -- unsurprisingly recommends putting food in plastic bags or containers. "It's an extremely efficient way of storing food," said Steve Russell, vice president of plastics at the Chemistry Council. Russell said plastic bags are better than some other storage containers because the air can be squeezed out, and some plastic cling wraps are designed to release carbon dioxide while keeping oxygen out -- which extends the life of some vegetables. It's worth noting that there are many ways of preserving food without plastic, including freezing, pickling, or using glass or ceramic containers. But before you get too down on yourself, consider this: While consumer food waste is bad, even more is wasted on farms or in transit, according to the United Nations. And it's not just fat cat Americans. Most food spoilage occurs in Asia, largely due to lack of refrigeration.